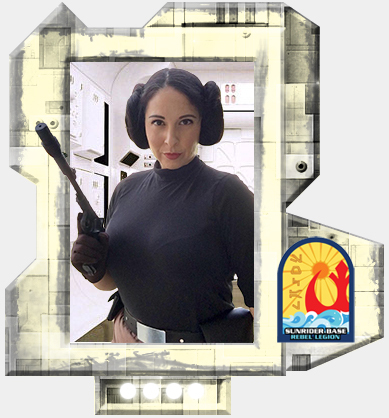 I have been looking for a pilot costume for the last few weeks as I need one for a special challenge our base is doing for 2019. 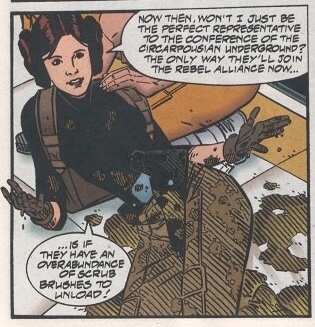 I just don't have the funds to do an OT pilot so searching the comics and EU seemed to be the best route. 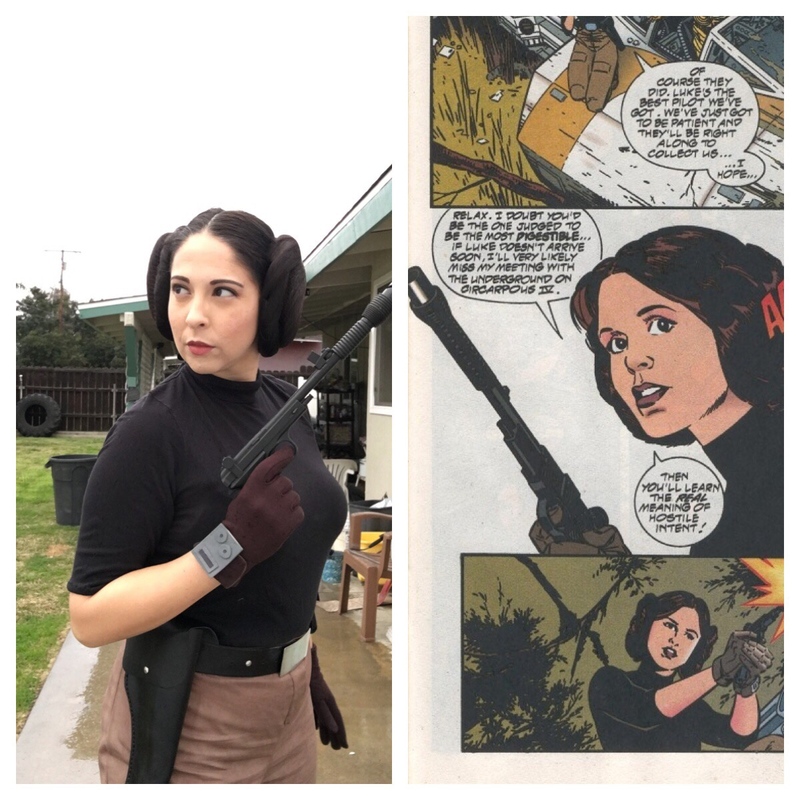 I was given the idea when I saw Jill's lovely "inspired by" Leia pilot from the comic book, "Splinter in the Mind's Eye." 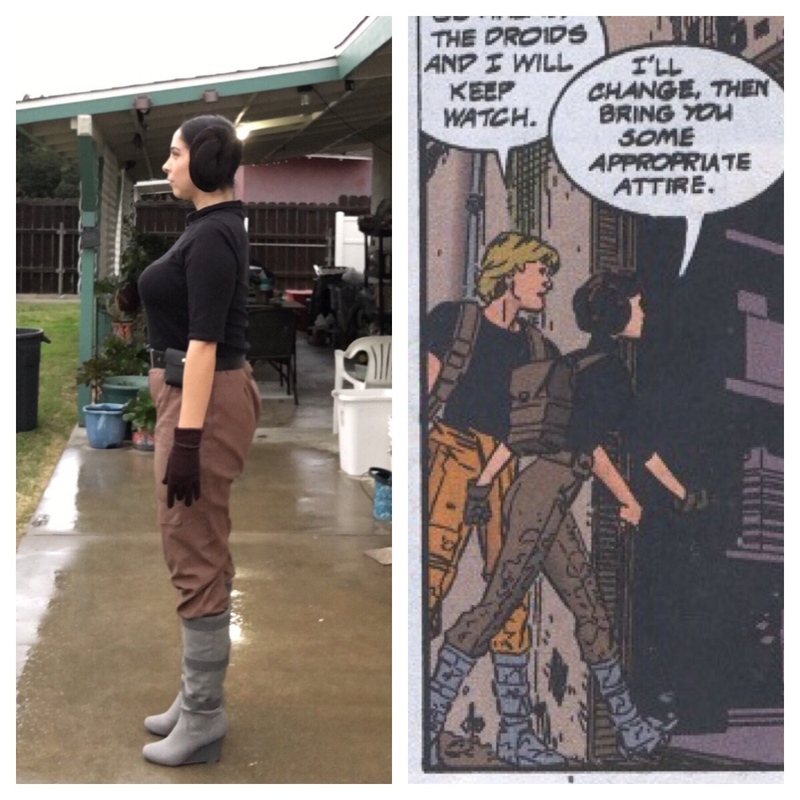 I was bummed that the orange pilot pants wouldn't work due to lack of reference but upon further study, I realized I could make the pants and use existing supplies I already had in my stash to make the costume that is shown in volume 1. I was excited to find the entire comic available online and was able to save all the photos and got reference from all sides by doing that. The costume itself seems pretty simple in hindsight but then again, after studying the reference, more details emerged. Here is what I compiled list wise of what was needed for the costume itself. 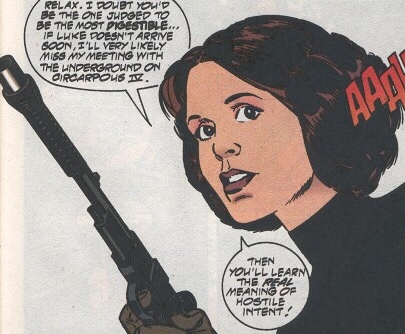 Leia is wearing her hair in her traditional ANH style as seen in this reference shot. 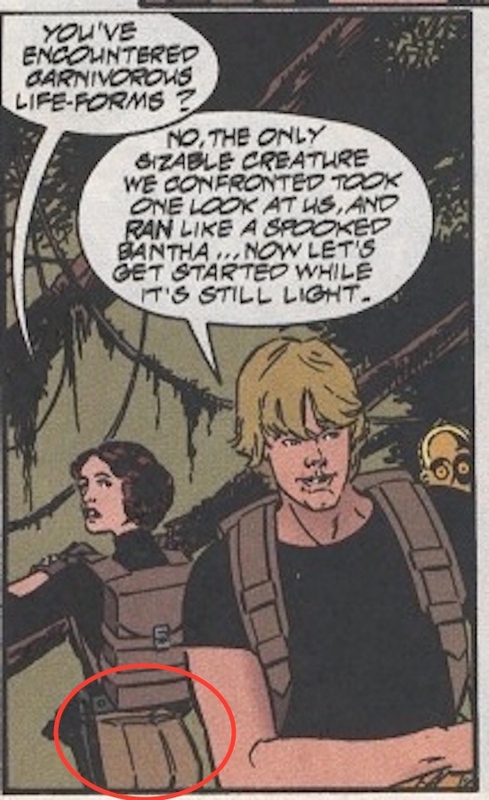 Blaster is the same blaster she uses at the beginning of "ANH" which is her Defender. Boots are her gray Millenium Falcon boots. I triple checked reference and for sure they are not the Hoth variant but the Falcon variant. Here are shots showing this. 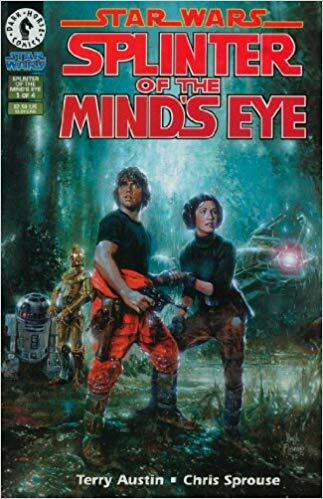 I found it interesting that only the cover art showed the Hoth variant but everywhere inside the comic it showed the Falcon variant. 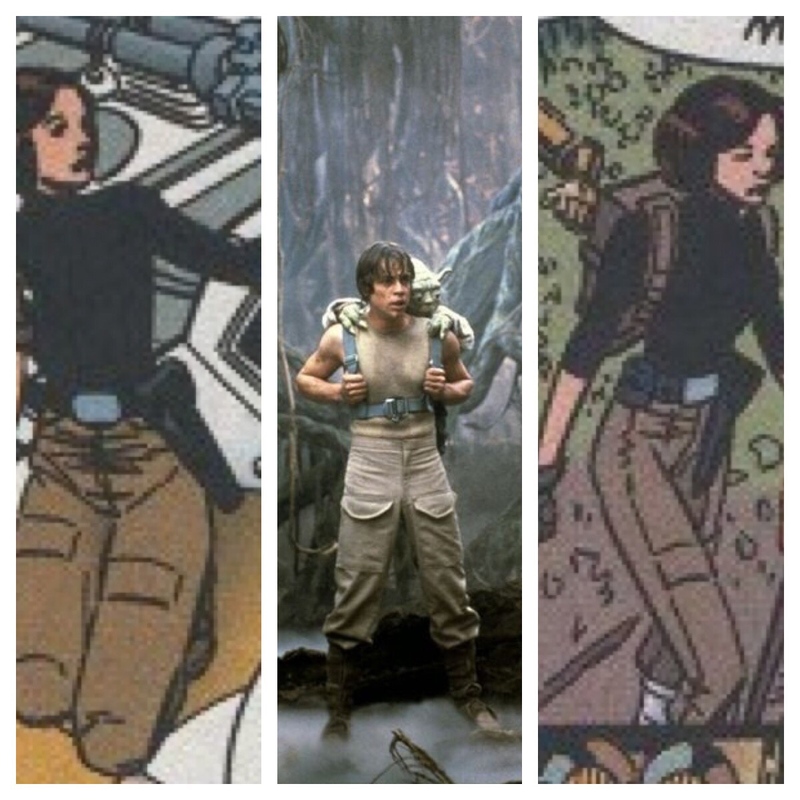 Leia is wearing a simple black belt with a silver, rectangular buckle. On either side of the buckle are silver rivets. 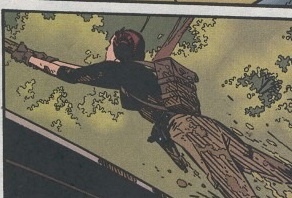 On her right side she is wearing a holster similar to her Endor holster but with a flap to close it that has one silver rivet in the center to close it. Top is a mock turtleneck with 3/4 sleeves. 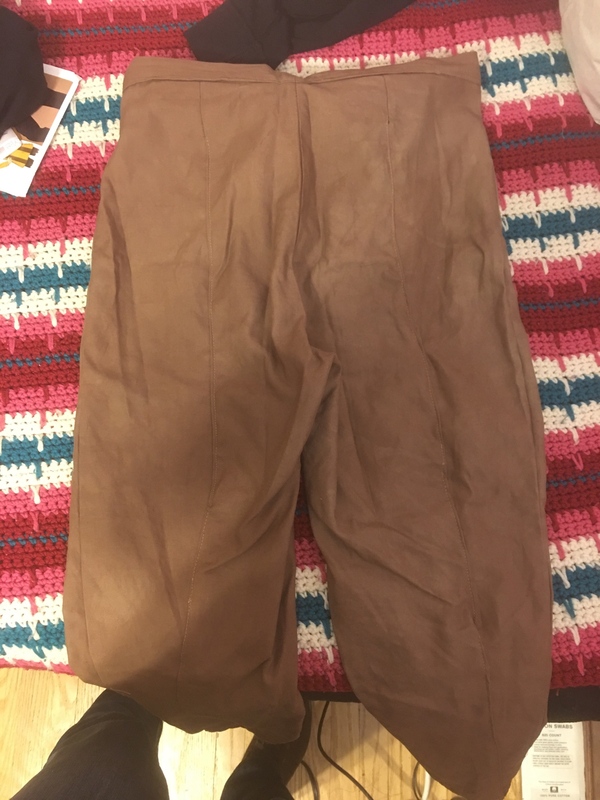 The pants are brown and high waisted. They have a fly. There is a pocket flap on each leg halfway between the thigh and knee. 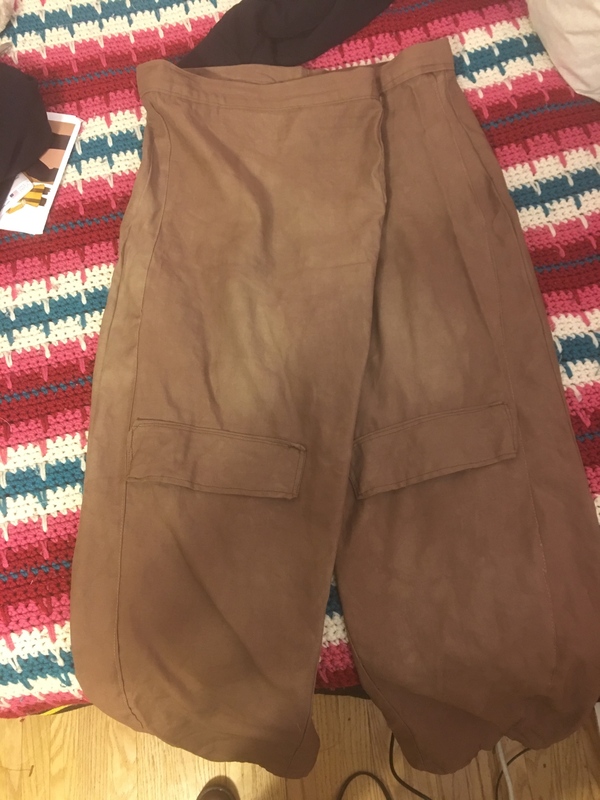 They appear similar in style to cargo pants but only have the two pocket flaps and no others. Brown fitted gloves with a cuff. There is a small square greeblie with 2 small circles and a smaller rectangle on it. The circles have a smaller black circle inside of them and the rectangle has a smaller rectangle in it as well. The greeblie is worn on the right glove cuff. 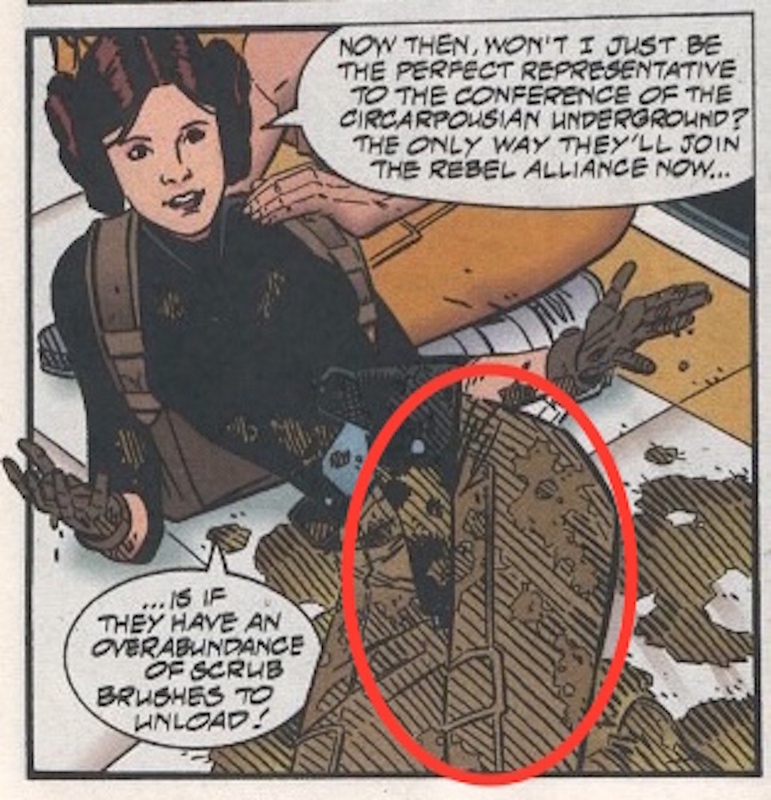 In addition, Leia is seen wearing a brown backpack through a portion of the frames in the comic. I am thinking this can be an "additional accessory" for this costume but, if necessary, shouldn't be too difficult to replicate. Once I had my research done and the reference in hand, I set to work making the outfit. As I mentioned above, I had most of the pieces already and those just needed simple modifications, if that. 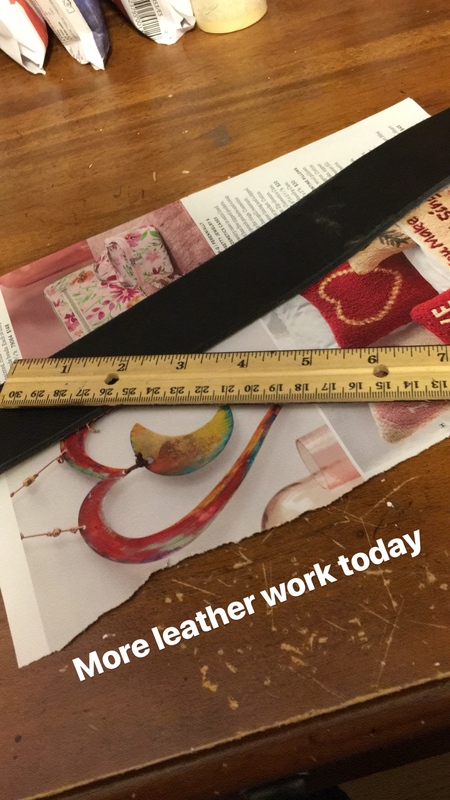 I took my black belt with buckle and measured the width of it to make a pattern for the pouch. 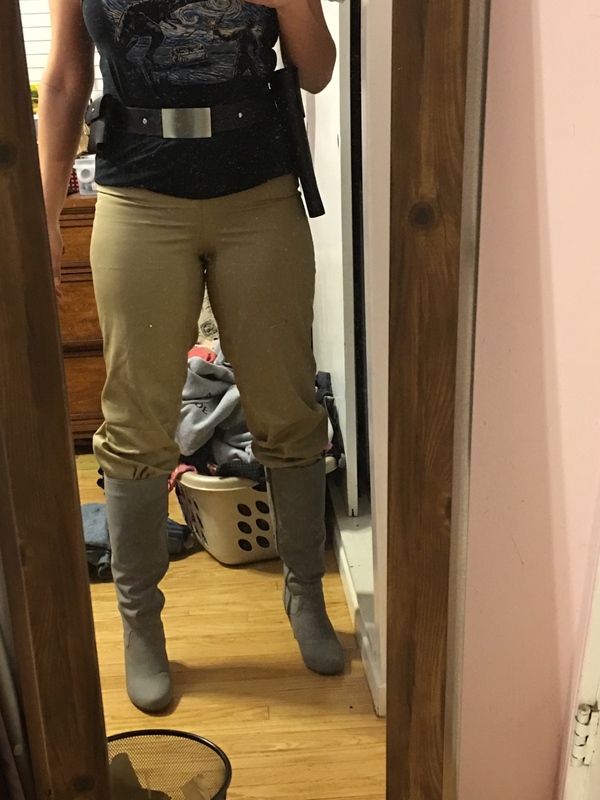 I had a big side of leather leftover from my Qi'ra build so I was glad I could finally put it to use. Once I had the general dimensions, I made a pattern out of scrap paper and then cut out the pieces. 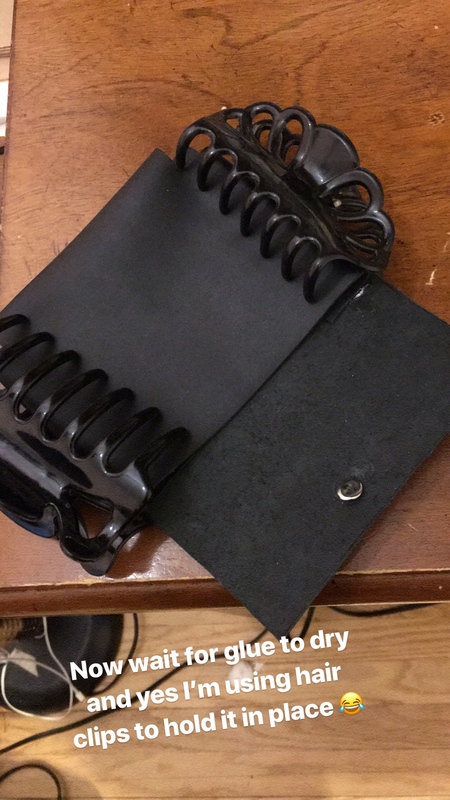 I was able to make the small pouch with only 2 pieces of leather. 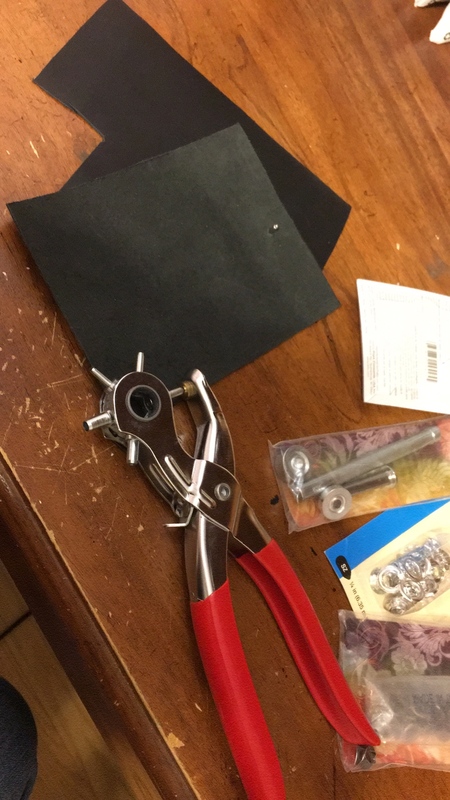 I don't have the necessary tools to sew the leather to itself so I purchased some Feibing's contact leather glue and prayed it would work. I also had extra rivets leftover from my Qi'ra build so I used those to add the correct closures to the pouch and belt. Once I had applied the glue, I let it dry overnight by keeping the pieces together using what I had handy, hair clips. 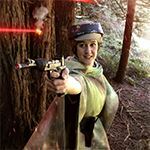 For the holster, I used the extra leather and rivets to fashion a flap to cover my Endor holster. Once the pouch was finished, I attached it to the belt and the accessories were done for that portion of the costume. The turtleneck was one I found at Goodwill for $1. 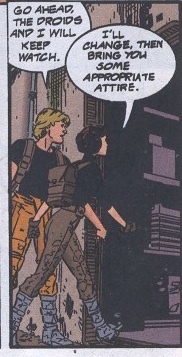 I modified the neckline so it would be shorter per the reference in the comics. Her neckline doesn't overlap at all and is a straight collar. The sleeves I took from long to 3/4 and hemmed. You can see in this reference that it is not a true turtleneck. I found great brown, cuffed (!) gloves on Amazon for $7 and ordered them right away. I constructed the greeblie out of 2 layers of craftfoam. I glued the top portions to it using Gorilla Glue and then used Velcro to attach it to the cuff itself. I also spray painted the foam to give it a more realistic look. The pants were the tricky part for me. Because they are high waisted, I couldn't just go with a pair of cargo pants from the store. The lack of pockets anywhere else also made it difficult to just use a store bought pair of pants. In the end, I found some fabric in my stash that had some nice stretch but was still pretty sturdy and I set to work making my mock. 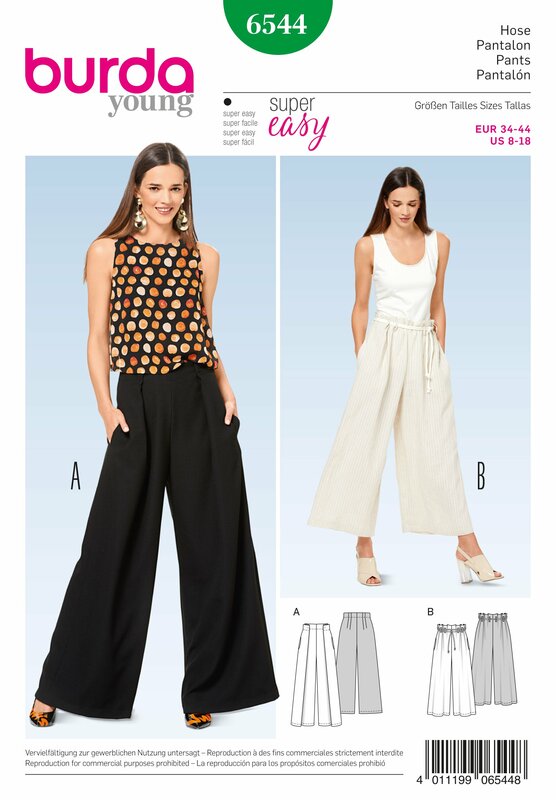 Initially I used Burda 6544 as my base as it was a pattern I already had in my stash. But after I made a mock up AND noticed she has a distinguishable fly in the reference, I scrapped that idea completely. In the top right frame, you can see she clearly has a fly and not slip on pants. Luckily the fabric was just spare that I had laying around and didn't cost me anything. Plus, apparently I have lost weight since I cut that pattern out. 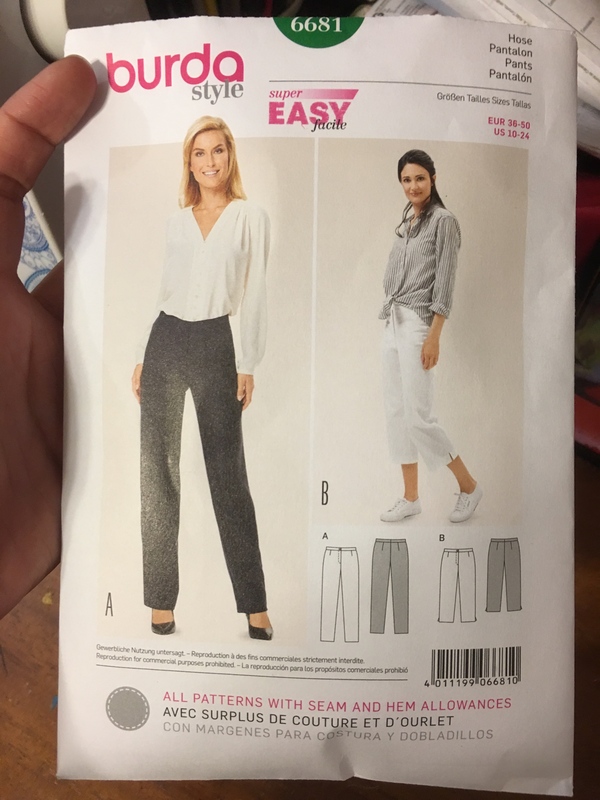 I found THIS pattern, also by Burda, in my stash and thought View B would be perfect for Leia's pants with a little modification. 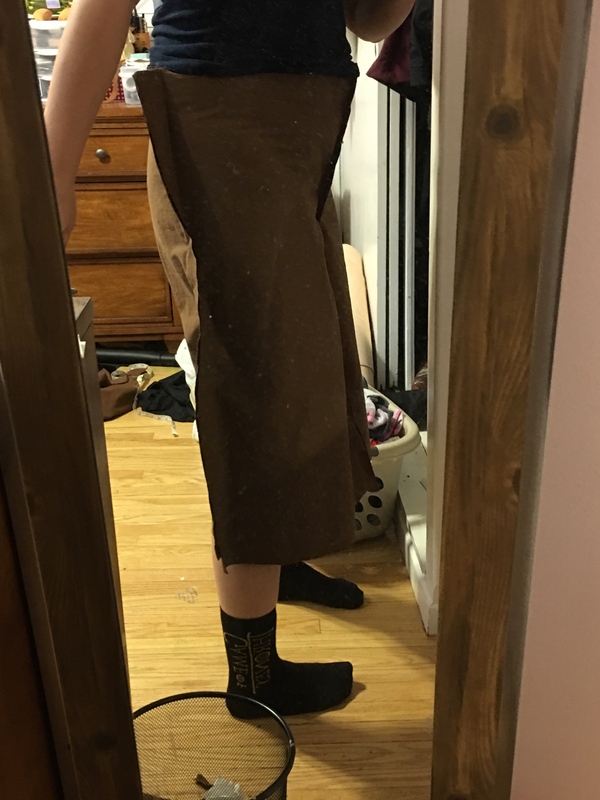 I eliminated the side slits, got rid of the pockets, and raised the waist by 3 inches to give me the high waist needed. I am super happy that it worked out how I had hoped with the new pattern. The fabric I used for the pants is a cotton/twill blend. 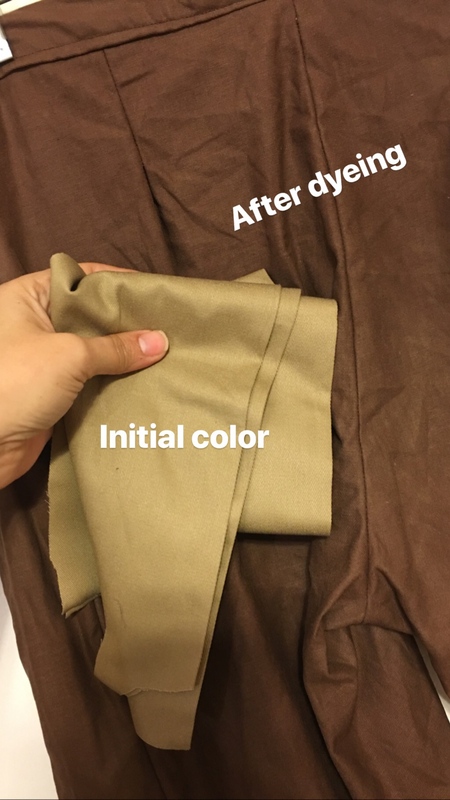 It was a beige when I used it but I figured I could just dye it after I was done to make it the correct color. 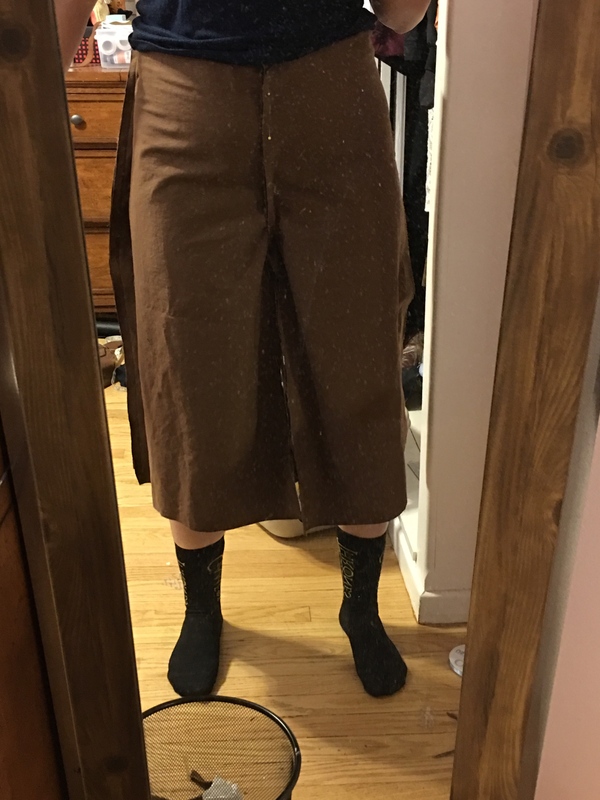 I don't have any photos of the actual making of process but this was the first try on after I had put the pieces together but before I had added the waistband and zipper etc. This was the final result before dyeing. 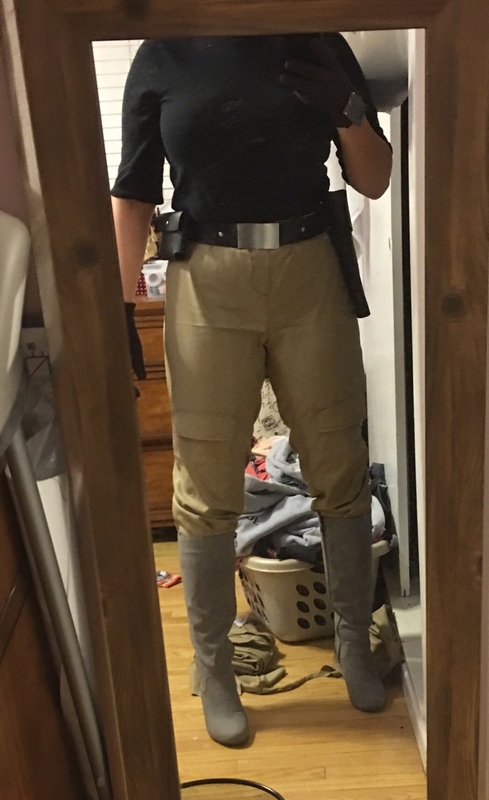 I tried on everything with the pants and I'm super happy with how the pocket flaps on the thighs came out and also just the overall fit. I don't really like making pants and this was maybe the 4th pair of pants I've ever made. 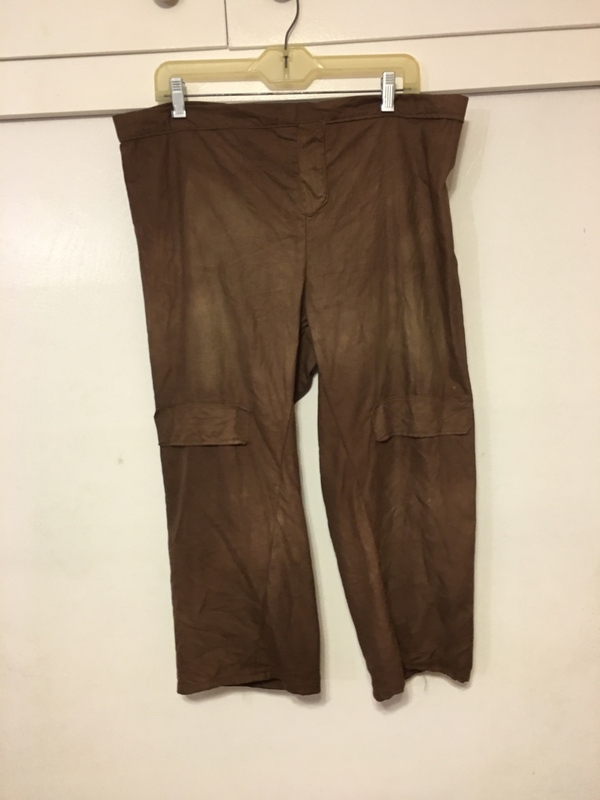 Once the pants were finished, I used Chocolate Brown RIT dye to dye them. I also had this in my stash so didn't even require a trip to the store to pick some up. Here are the pants fresh out of the washing machine. The color came out great. Once everything was done, I suited up and took some quick side by side shots. I am hoping that this does indeed get put as a pilot and that is what I submitted her as. Where this costume will be placed I am not sure but I have to say I love the whole aesthetic. 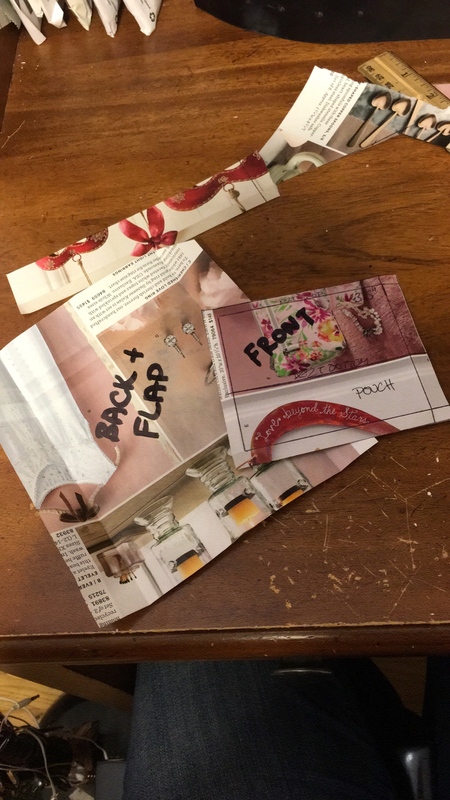 I am hoping to make the backpack as an accessory this week with some leftover canvas I have and if it comes out how I have seen, I think it will look great. Hopefully lol. The boots are my pre-existing Hoth boots, Falcon variant. Not sure if I mentioned that above. The blaster I already had and is a Rubie's one that I sanded and then spray painted with Flat Black spray paint. I used Kanekalon for my hair twisted into my own hair to achieve the buns. 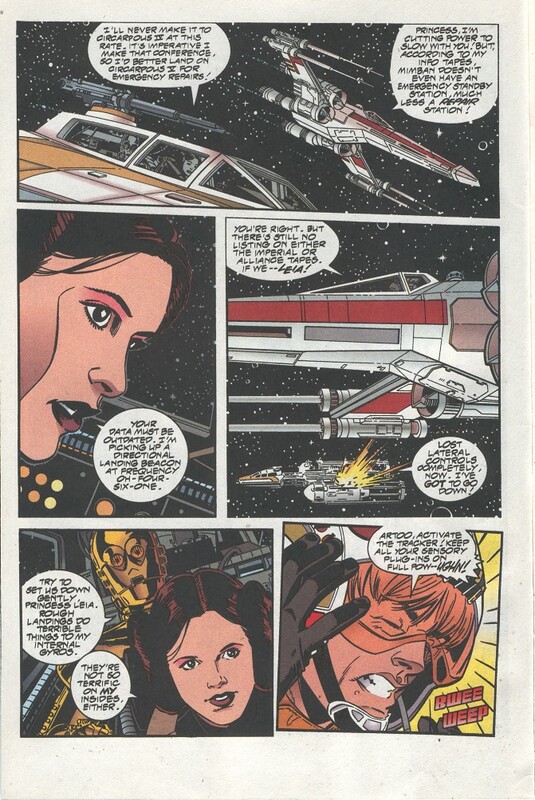 Also, for reference, here are the frames showing Leia actually piloting a ship. 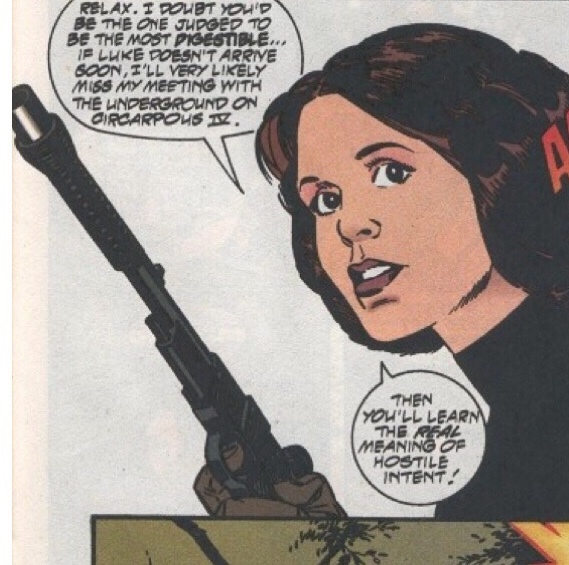 Lastly, here is a link to the discussion that was had deciding where this particular costume of Leia's should/would fall. I'm so glad I found this costume and look forward to wearing it in the future. Hey lady, I have some feedback on the build. 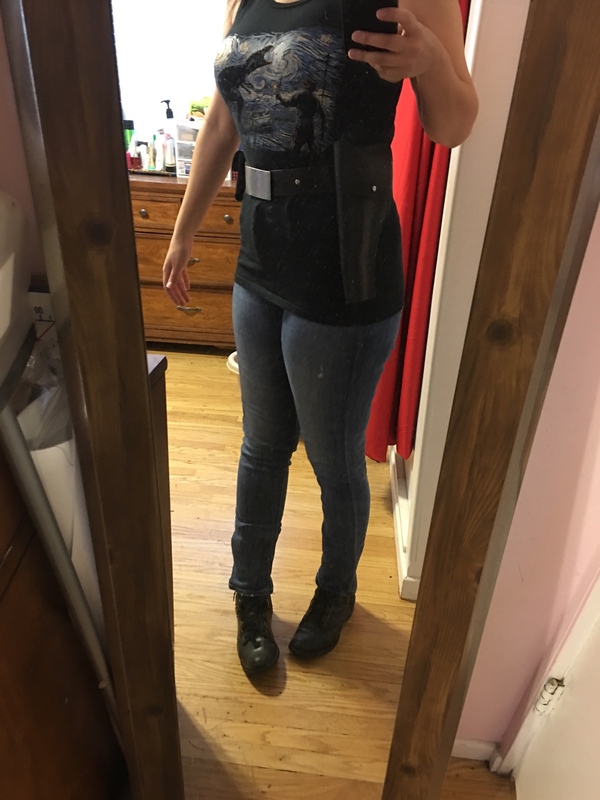 It looks like the holster is on the left side in all the pics, but she still holds gun in right hand, so I'm thinking just move the holster over to the left and say it's a cross draw situation. The buckle has rounded corners, not sharp ones like a Resistance buckle. I feel it should also be weathered. 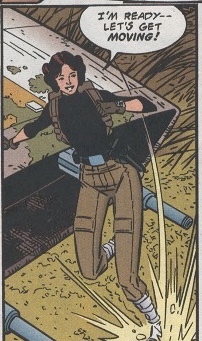 I honestly still think even the subjective little comic book square still shows a spat flap for the boots. But I think you can easily cut those out of vinyl and weather paint them to look muddy and just add those to the boots you have under the straps. If I were a judge I'd take that for a comic book interpretation. I mean, it's a drawing. You can't really tell. Also, I think the loose strand of hair at the forehead is in the frames too. 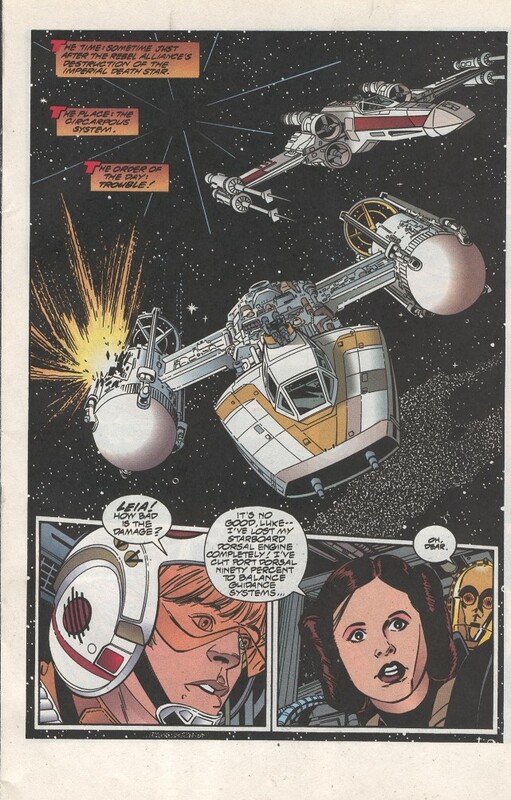 That kind of sets it apart from A New Hope a little and I like that. 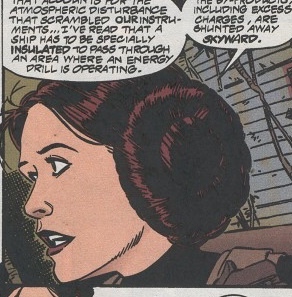 I like when her hair is mussed in the Death Star escape in the movie too. I'm looking forward to some judge feedback so we can get the modifications done and move forward. Speaking of judge feedback, we both need to weather our pants a lot. It'll look soooo much cooler. What do you think about the gloves? 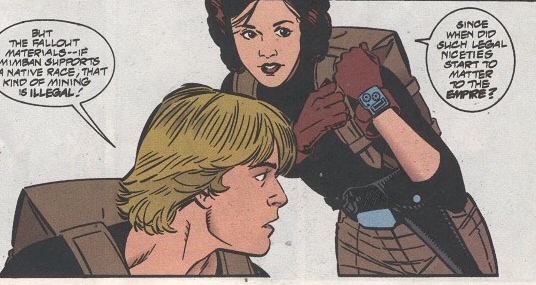 It looks like you made some so that you have the flap with the wrist comm, which totally matches the comic. I think they should be leather though. 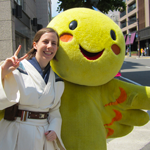 I don't know any Star Wars gloves that are not, especially flight gloves. Interesting as there are at least two panels where it is flipped. To save time on submission, I just retook shots with it reversed. Thanks for pointing it out. Nope, not a Resistance buckle. It's a RFT buckle. Luckily I have one randomly and can replace it if necessary. Love these little details! Even I didn't notice that one. Glad Jon pointed it out. However, I disagree on the weathering. If you are doing the version AFTER she falls in the mud then yes, weathering and "muddying" and the backpack should also be required at that point. Depending on where in the book you reference, she is weathered after mud but not before as shown in posted pics. Cannot require leather gloves in standards based on personal beliefs etc. 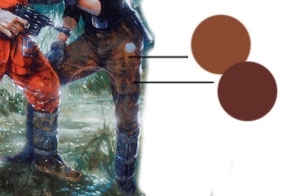 In my quest for as complete and accurate a costume as possible for this look, I reached out to both the cover artist and the "inside" book artist about the pant detail and color. To my great surprise, Hugh ( the cover artist) responded back within a day and gave great insight. 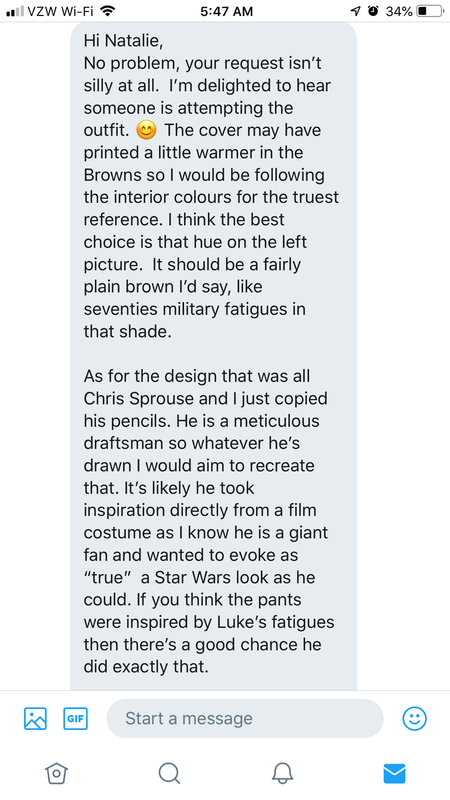 Here is his response in regards to the pant color and design. I sent him both the cover shot and this photo as reference in my initial query. Also, Anya did a color pull of the artwork and when put against a white background. 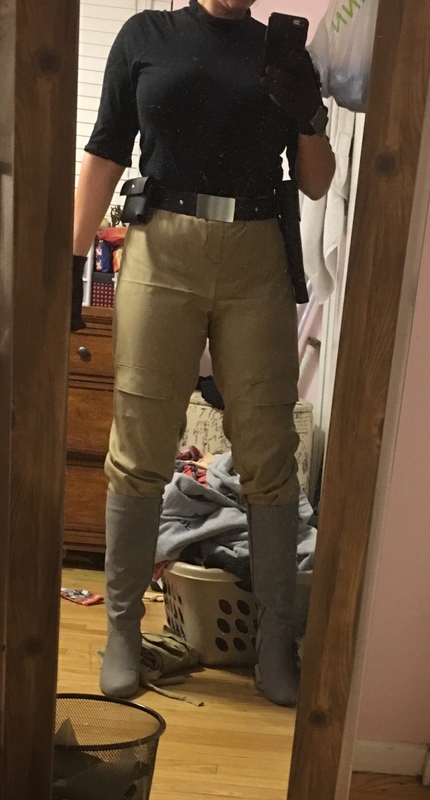 This was posted in the thread about the potential new standard but I'm posting it here as well since the costume is now officially a royalty costume. That's fantastic that the artist replied back! Do you want this thread in the pilot forum, since it will be judged by the pilot judges? I can move it there for you if you'd like. Right?!? I sent it out with fingers crossed and got a response. He was excited to hear people were recreating his and Chris's artwork in real life. According to Dawn, in a post on the standard proposal, this is a royalty costume and not a pilot and will be judged by royalty. I believe this decision was made and posted yesterday but not positive. I guess just leave it here then? Sounds good. We'll keep it here. 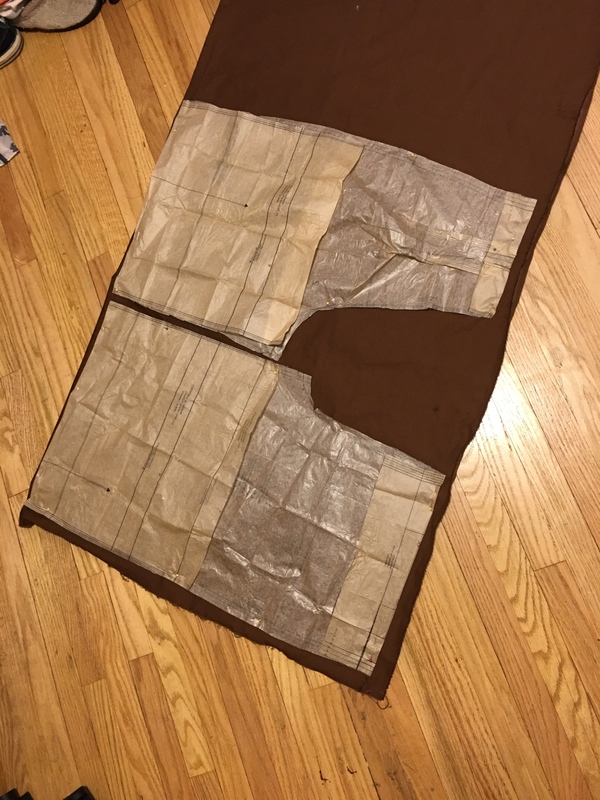 After my costume was reviewed, I was asked to add a center back seam down each leg and a "side" seam that runs along the pant near the side seam but not the side seam itself. 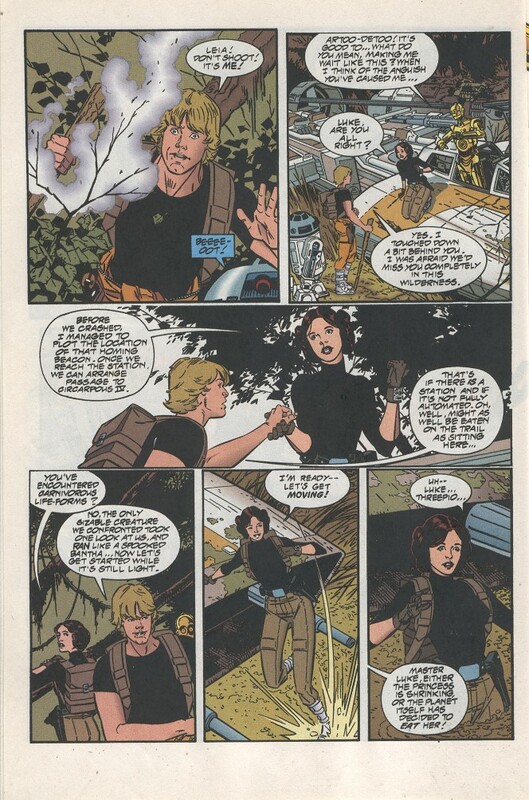 The seams mentioned are shown in these two reference shots from the comic. Approved. Thanks to my judge for helping me make the small tweaks needed to make this one even better.